Roses are at the heart of both A.S.APOTHECARY and Amanda's new drinks company Fierce. We grow 200 of them at the farm in Plumpton, and use six different varieties in our products. As a central protagonist in our brand story, they feature heavily in my own content marketing work here. I've seen the petals in the shop, drying on racks in Summer, I've photographed them as they turn from silken shells to crunchy flakes, their bright hues fading beautifully. 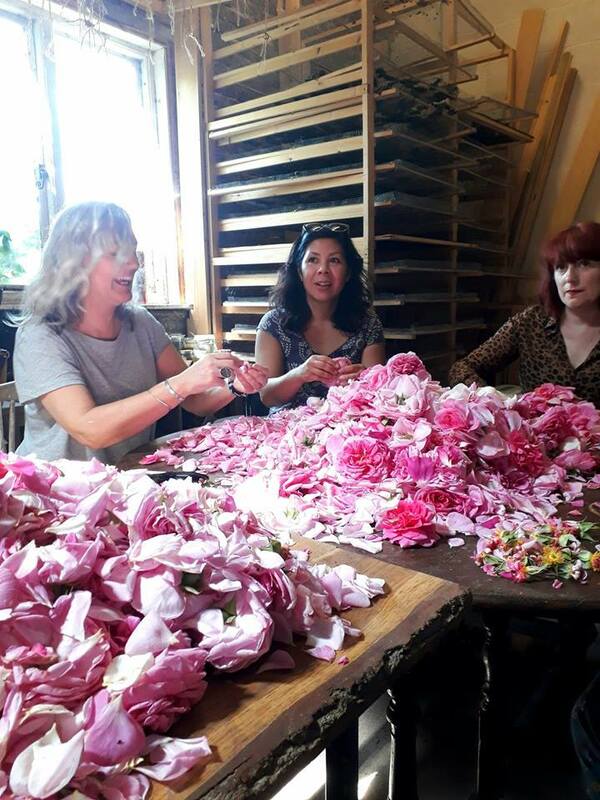 I've written about roses, their uses in the A.S.APOTHECARY skincare range, I've visited the farm, and uploaded countless images of roses at each stage of the making process. But until last week I had never experienced the annual A.S.APOTHECARY team rose pick & sort at the farm in Plumpton. It's not an obvious addition to a bucket list, but after having enjoyed it first hand, I would certainly suggest you add it, with a couple of caveats: do it on a warm June morning, with a group of inspiring, big hearted women. We start outside, in the fresh morning light, and work our way up between the rows of blooms, picking just the open rose heads and dropping them into baskets, as insects buzz and hover about and green downland surrounds us. It is such a romantic start to the day, but my favourite part by far is in the barn. All ten of us gather around the huge wooden table, where the baskets of roses are emptied. We plunge our hands in and pluck the petals from the calyx (the central part) of the six different types of roses we grow (listed below). It's the sheer abundance of rose petals and the visual and sensual impact they have on you which is such a visceral pleasure. There are mounds and mounds of them, more than enough to submerge yourself in if you wanted to. More than I have ever seen in one place, so that the scent of them is overwhelming and slightly intoxicating. They are cool and silky velvet like a peach skin on your fingers. We quickly became rowdy and ribald, in that playful and earthy way women often do when they get together in groups, when no men are present. There is something so grounding, connecting and perhaps primal or ancient about this communal activity, as if it's already in our bones, and I think, as women, we could do with more of this in our everyday lives. Ritual, belonging, meaningful group work. I feel really lucky to work with such a team of wonderful women, all talented, kind, wise and supportive. Later, I was interested to discover that rose gathering around the globe is traditionally done by groups of women, in Bulgaria and Kenya. And perhaps it was the chemicals in the scent making us high: roses are great for lifting the mood, they are also aphrodisiac. There was more than one mention of American Beauty, a few of us pushed our faces into the foot deep piles of petals and inhaled, someone said they would willingly strip off and dive in! The myth that women struggle to get on together as a group is simply a falsehood, at A.S Apothecary we are a tribe. Scepter'd Isle – a light pink rose with a powerful myrrh fragrance.